Adding a background to your project is essential when you are creating any visual content. There are few ways you can add a background to your project. One way you can add a background to your project is by clicking anywhere on the canvas. You will then see a toolbar at the top of your screen that says Upload background. Tip: Make sure not to select padding area where there are objects displayed. It will select the objects instead of the upload background option. Or, right click on the Canvas to select Background option. An option for Upload Background will show up at the top of the panel. If you are working on an infographic, you have the option to upload background from each block. Learn how to use Content Blocks. Simply select a block, a tool panel will then pop up on the right side of the canvas. Choose the setting icon below the trash icon and select Background. An Upload background panel will appear on the top left of your screen. Start to upload your background color or a background image. Another way to set your image as background is to click Graphics from the left panel and under the Photos tab, drag-and-drop an image into the canvas. 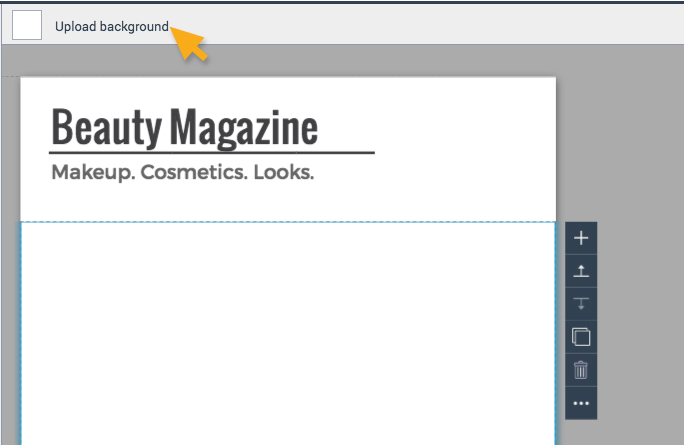 Tip: When you drag-and-drop an image into your canvas, drag-and-drop it over where it says Drag here to add as background to set the image as background. Otherwise, drag-and-drop over to where it says “Drop here it to add to canvas”.